The University of California, one of the world's most prestigious institutions of higher learning, has encountered a seemingly insoluble problem as it sets it sights on being carbon neutral by 2025. The problem isn't getting clean electricity, like solar power, which has become standardized and often inexpensive. The problem is how to replace natural gas. Four of its 10 campuses and one of its five medical centers run on big cogeneration plants, which produce electricity and use the excess heat to supply campus heating and cooling. They run on natural gas, which has half the emissions of coal but still spews plenty of carbon dioxide. There is no affordable, renewable fuel that can take its place. "It's the hardest nut to crack to achieve carbon neutrality," said Matthew St. Clair, the university's sustainability director. The University of California system is finding gas is a stumbling block on its road to carbon neutrality. 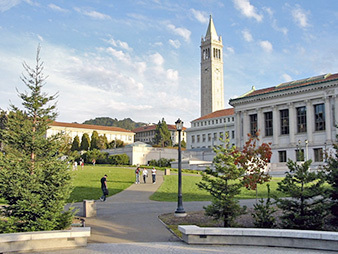 The UC Berkeley campus is shown here. Photo courtesy of Wikipedia. The first institutions to struggle with the problem of natural gas are businesses, utilities and others that have set aggressive targets to reduce their carbon emissions. Many are finding that renewable heat is much harder to obtain than renewable electricity. Half of the world's energy is either used as heat by industry to make the products of modern life or used to heat buildings, according to the International Energy Agency. And three-quarters of that building heat is supplied by fossil fuels or other nonrenewable sources. These leaders are finding that, while lower-carbon alternatives to natural gas exist in theory, the reality is that they are difficult to obtain and expensive -- much like solar power was a decade ago. The University of California would like to power its cogeneration plants with biomethane and has found a few ways to get it affordably at small projects that pull excess methane from wastewater treatment plants, closed landfills and agricultural waste. But on a larger scale, the market isn't mature enough to offer a solution. For example, it was fairly easy for the university in 2014 to lower its electric carbon footprint by buying the output from an 80-megawatt solar farm, which is on its way to becoming standard industry practice. But "we can't do that for methane," St. Clair said. "We can't put out an RFP [request for proposal] and get responses for either the volume of gas we need or anything that would be less than 300 percent of what we're paying for natural gas." The same natural gas obstacle is experienced differently by Procter & Gamble Co., the Ohio-based conglomerate that is one of the world's largest makers of personal-care products. P&G is among the more ambitious industrial companies when it comes to lowering its carbon footprint. Among its goals is to power its 130 manufacturing centers around the world with 30 percent renewable energy. But even if it were to supply 100 percent of its electricity from renewable sources, it still can't meet the target because what industry needs even more than electricity is heat, said Steve Skarda, the company's global climate and energy leader. Why not? Skarda said that Procter & Gamble is typical among heavy industry in that the bulk of its energy needs, about two-thirds, are soaked up in heating, such as drying products. That means that thermal energy represents about half of its carbon emissions, he added. About 33 percent of all natural gas used in the United States goes to industry, according to the U.S. Energy Information Administration. Next year, P&G is expected to complete the build-out of a $200 million, 50-MW cogeneration biomass plant in Albany, Ga., which is supposed to supply all the steam needed for a factory that makes Bounty paper towels and Charmin toilet paper. Supplied by wood chips from the local forestry industry, the plant is expected to get the company as much as 7 percent toward its 30 percent goal of renewable energy. While the company is proud of the solution, it won't work everywhere because not every factory has that much burnable biomass handy. As Skarda pointed out, "You can't move steam long distances like you can electricity." Furthermore, there are many cases where steam cannot generate the extremely high temperatures that are key to certain industrial processes. "Most of the conversation and policy and infrastructure is around renewable production of electricity," Skarda said. "When you look at natural gas, the solutions are not nearly as obvious." The same heating obstacle presents itself in businesses and residences, which consume almost an additional third of U.S. natural gas, according to the EIA. In Palo Alto, Calif., one of the most prosperous cities in Silicon Valley, the city owns both the electric and the natural gas utility and has been aggressively cutting its carbon emissions for years. Still, the percentage of the city's carbon emissions that come from natural gas hovers unchanged at about 25 percent. The city will soon try an incentive for homeowners to switch out water heaters that run on natural gas for ones that run on electricity, said Gil Friend, the city's chief sustainability officer. The city is also mulling whether to alter building codes to require new or remodeled construction to transition away from natural gas and toward electricity. Palo Alto is one of the country's few cities to get virtually all of its electricity from renewable sources or from renewable energy certificates, also known as RECs. Transitioning away from natural gas is key for California to meet its goals of reducing carbon emissions, Friend said, but doing so too aggressively also holds risk for a city like Palo Alto that owns the natural gas system. If the city succeeds in fostering an alternative to natural gas, it "faces a potential situation where the natural gas system has declining revenue and ongoing fixed costs," Friend said. "What do you do?" Data suggests that the most obvious answer -- supplanting natural gas with renewable biogas, from agriculture or from waste -- may simply be impossible because there's not nearly enough supply. Another solution, some advocates say, is to "decarbonize the pipeline" by using excess renewable energy produced from wind and solar farms, on peak sunny or windy days, and use chemical means to turn it into replacements or enhancements to natural gas. One approach -- technically feasible though rarely tried -- is to use electricity to perform electrolysis on water molecules, splitting them into elemental oxygen and hydrogen. The hydrogen could then be added, within certain safety levels, to existing gas lines. Another approach, called "power to gas," would take that elemental hydrogen and combine it with carbon dioxide to produce methane -- synthetic natural gas -- which could be dropped into the existing natural gas pipelines. Others who observe the stubborn role of natural gas in carbon emissions say that the solution is to take as many products as possible that use natural gas and switch them over to electricity, where the ability to produce renewable, low-carbon power is already well-established. "I think we are ultimately heading toward the electrification of almost everything," said David Hochschild, a commissioner for the California Energy Commission. As an example of how this could be applied to homes, he pointed to City Ventures, a California real estate developer that builds housing complexes without gas lines. All appliances that typically run on natural gas, from the kitchen burners to the water heater, run on electricity. It is at these institutions trying the boldest experiments in going low carbon that the solution to the natural gas conundrum will likely be found. "If we can't figure it out with the best minds in the world," said St. Clair at the University of California, "who can?"